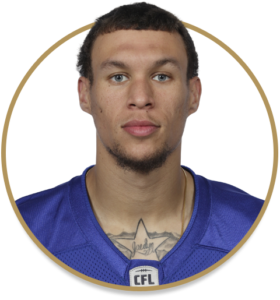 The Bombers made Simonise their first choice in the 2018 CFL Draft, selecting him in the second round, 12th overall. Simonise would dress for all 18 games and both the West Semi-Final and West Final. He finished the year with four catches for 122 yards and added another, for 27 yards, in the West Final. Simonise spent three seasons with the University of Calgary Dinos. In 2015, Simonise had 1,013 yards and 65 catches in 8 games and was named a First-Team U Sports All-Canadian. In 2016, Simonise signed with the Cincinnati Bengals as an undrafted free agent.